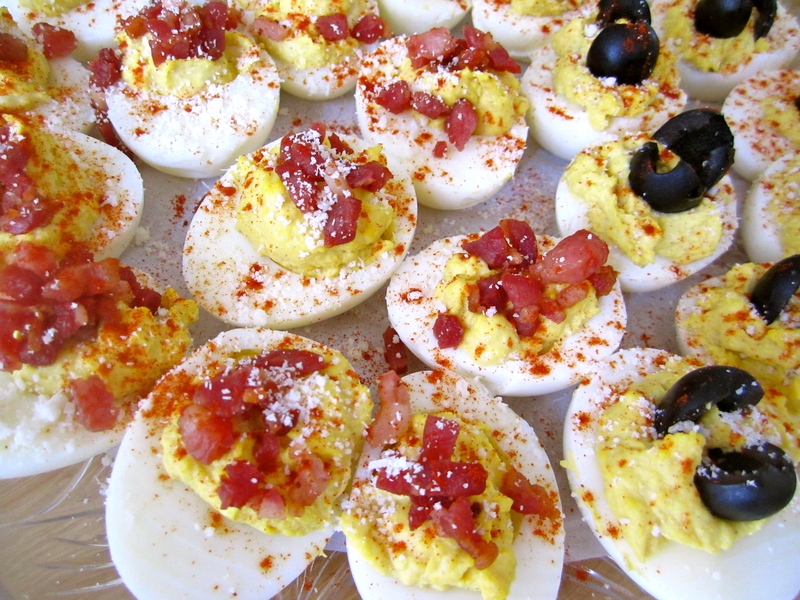 I decided to get a little creative with the ingredients and stray from some of the more “traditional” styles of deviled eggs, and they turned out to be a huge hit: especially if you have any bacon lovers in the group. Last weekend I prepped for two different back-to-back events, so I made a fairly big batch (ingredients will obviously vary depending on how many you’re cooking for). THE EGGS: Place the eggs in a pot of cold water, turn on the stove and bring to a boil (uncovered). Let the eggs boil for a 2-3 minutes, then turn off the burner but let them sit in the hot water for about 15-20 minutes. Pour out the hot water and let the eggs soak in cold water for awhile (at least 15 minutes). This process will make pealing the shell off much easier! 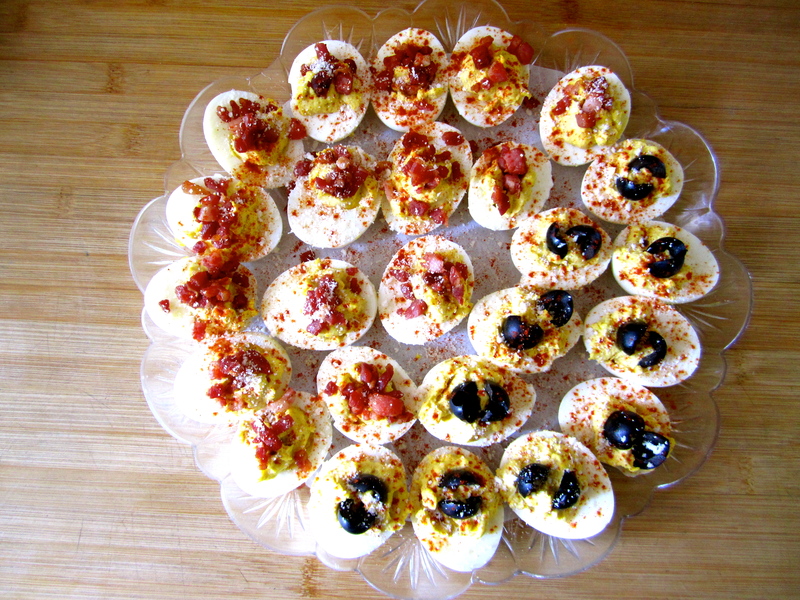 PREP THE BACON, OLIVES & YOLK SAUCE: While the eggs are boiling and cooling off, cook your bacon and slice up your olives. Set them aside in separate dishes as you’ll use these ingredients to garnish later on. In a medium sized bowl, add the mayonnaise, mustard, honey, olive oil, lemon juice, salt, pepper and a tablespoon of parmesan cheese. (For most of these ingredients I said 2-3 tablespoons or 2-3 teaspoons: I’d start with 2 and as necessary add more once the yolk has been added to the mixture. That way you can achieve your desired texture & taste). At this point your eggs should be cool enough to peel. 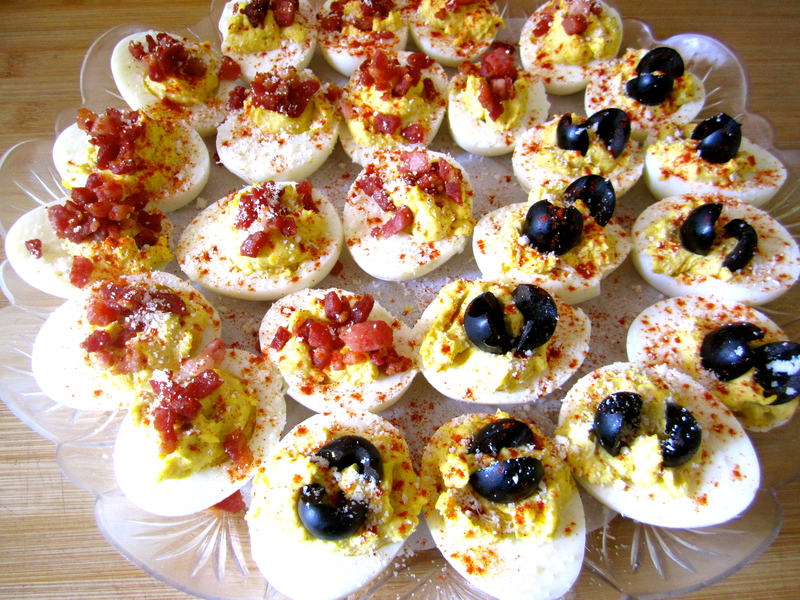 Once that’s done, cut them in half carefully and place the yolks into the sauce you created previously. 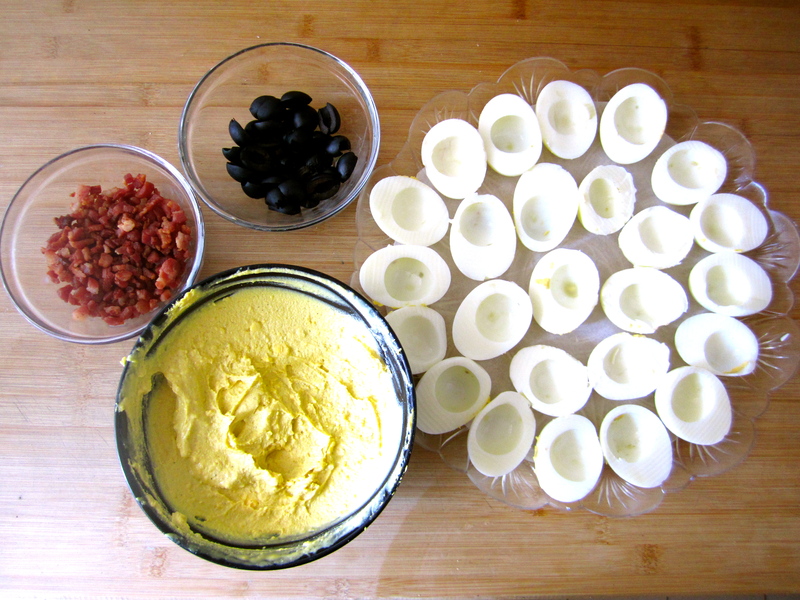 Use a small hand mixer to blend everything into a nice, creamy egg yolk paste. Use a teaspoon to place a nice scoop of the yolk mix into each of the egg white halves. 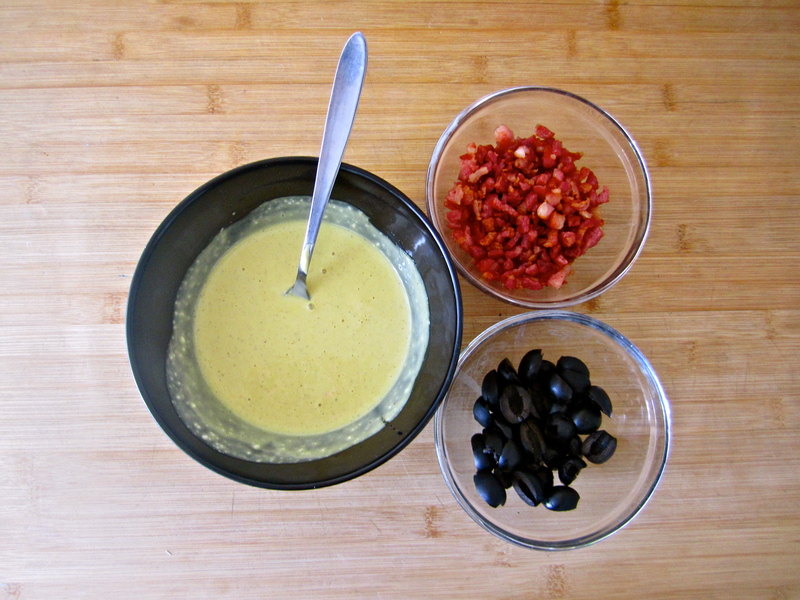 Once it’s all distributed evenly, add your crunchy bacon bits to some, and your black olive halves, to others and finally, sprinkle the other tablespoon of parmesan and a bit of paprika over the top!